The Huskies (13-4, 4-0) won their sixth straight game and improved to 9-0 at Alaska Airlines Arena. The Huskies moved into first place in the Pac-12 after Thursday’s 80-64 win over Stanford. Washington (13-4, 4-0) won its sixth straight game and improved to 9-0 at Alaska Airlines Arena. Washington shot 51.7 percent from the field, 42.9 percent on three-pointers (6 of 14) and committed a season-low six turnovers, which are indicators of an efficient offense. But the Huskies finished with just eight assists on 30 baskets. For the most part, Thursdays’ game allowed Jaylen Nowell and Nahziah Carter to showcase brilliant 1-on-1 abilities. The UW sophomore guards repeatedly got into the lane and either finished at the rim or pulled up in the lane for mid-range jumpers. Nowell hit 9 of 19 shots, including 2 of 3 three-pointers for 22 points. Carter could hardly miss in the second half as he canned 6 of 7 shots for 13 points. Only four guards are among the 15 players in the Pac-12 shooting 50 percent or better from the field, which includes Carter (52.8 percent) and Nowell (51.6). The offensive heroes change with each outing, but Washington’s suffocating defense has been the mainstay during its six-game winning streak. The Huskies have allowed an average of 61.5 points in the past six contests. Led by Matisse Thybulle, who had five steals, UW forced 18 turnovers. Those miscues resulted in 24 points for the Huskies. 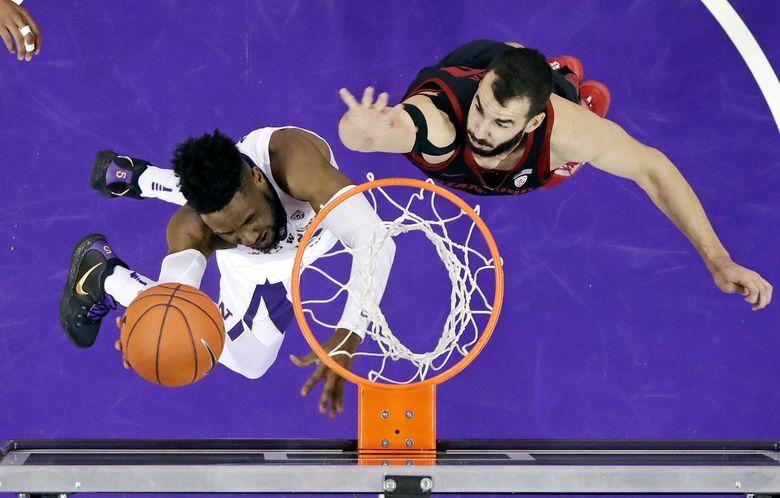 Washington also shut down Stanford’s perimeter offense, which connected on 3 of 15 three-pointers.